Earlier this year myself and a couple other of my classmates were given an amazing opportunity to intern for the Filipino Journal. This included the lovely Jackie Doming. Like me, Jackie is doing a graduation project for our program. Her project is a clothing and accessories line called Threads of Hope, and a concert, all in support of the Children’s Wish Foundation. She has been doing an amazing job raising funds and awareness for the charity. Recently we teamed up with Filipino Journal again who gave us the opportunity to write about our projects in the paper. Although we could have written our own articles, we thought it be a good idea to write an article for each other’s project to give a fresh perspective. and she was drenched in scalding water, resulting in second- and third-degree burns on the left side of her upper body. 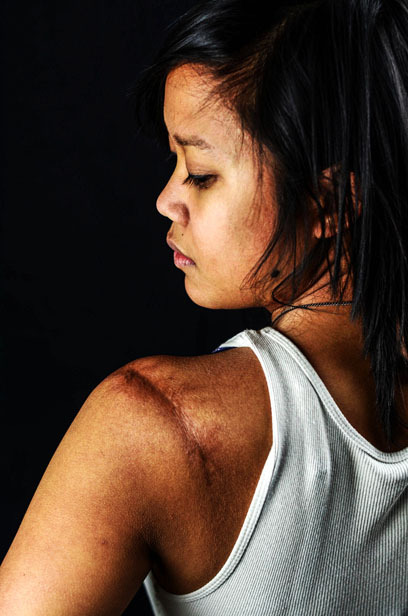 Laureano, a second-year Creative Communications student at Red River College, has been a burn survivor most of her life, but only recently decided to go public about her accident. She is creating a website called After the Cocoon for a school project, a blog featuring photos and stories of burn survivors – including her own. “I was very discrete about it and only shared that information with a small circle of tight-knit friends and family. It used to be very difficult for me to talk about my burn injury, but now I talk openly about it so that I can help other people who are going through a tough time,” said Laureano. Her project began with research, conducting interviews and taking photographs of burn survivors for the website. She connected with participants through the Canadian Burn Survivors Community (CBSC) and Mamingwey Burn Survivors Society. Both organizations also provided financial support to Laureano, helping her travel to the CBSC national burn survivor conference in Calgary last summer. One of her goals is to spread information about burn survivors that may not be well known, such as the different types of burns that exist. Along with the website launch, Laureano is working on marketing After the Cocoon. She traveled to the World Burn Congress, an international burn survivors conference held in Milwaukee, and attended the Mamingwey conference to promote her project. She is also using social media (Facebook and Twitter) and previews on her blog to share information on the upcoming launch. Ultimately, she wants the awareness built by the project to encourage people to donate to burn support organizations. After the Cocoon is launching on February 9, 2013, to coincide with her 25th burn anniversary at the Fire Fighters Museum on 56 Maple St. Previews of the project can be viewed at afterthecocoon.com. Special thank you to Jackie for writing this for me and if you’re interested in reading the article I wrote about her project, click here.